Ambassador of Pakistan to the U.S.
"We ought to be able to be part of the 21st century’s thrust towards co-operation – rather than towards confrontation, which has been our history." School years divided between Lahore and Rawalpindi. 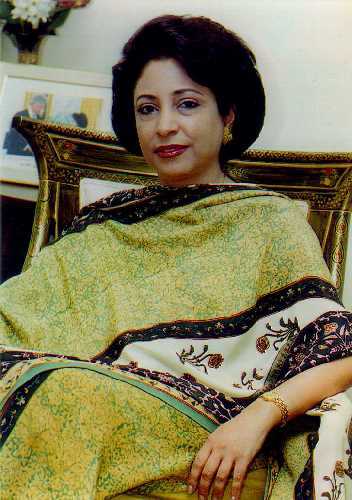 Career Path – Began with teaching for a short while at the Qaid –e –Azam University, Islamabad; then at the London School of Economics – where she taught courses in Political Sociology for 5 years – followed by a decade long career in journalism as Editor of the daily ‘The News’ – and now four years in diplomacy – this is her second tenure as Pakistan’s Ambassador to the US – the first from 1994 to 1997 – the second starting a year ago in 1999. Which was the most challenging of the three diversely different careers - teaching, journalism or diplomacy? Each is challenging in its own way – but journalism becomes more challenging in our part of the world where media, particularly print media, has to assume a greater role and responsibility because our political institutions are still in the process of evolution. To give you an example, in Pakistan we have had a whole series of rather weak Parliaments - hence the whole issue of public debate, on issues of the day, is not something we have seen happening in the Parliament as much as we see it happening in the press. In that sense, journalism has been more challenging. My country has had a long standing relationship with the U.S., but in the post cold-war period this relationship was bound to undergo changes – changes in line with a transformed world. We are trying to redefine and reconstruct this relationship so that it is more in synch with the post cold-war world. The issues we have dealt with range from issues of nuclear non-proliferation to issues of bilateral co-operation, to issues of regional peace and stability, which are linked to Pakistan’s geographical location. Pakistan is not just a part of South Asia – Pakistan straddles three regions. We are South Asians but we are also southwest Asians and we are also partly central Asians. In fact Pakistani identity or Pakistani personality is an amalgam of three great civilisations. We are positioned in a part of the world, which is politically volatile, but also holds a lot of economic opportunity. It is a very challenging bunch of issues. There are about 700,000 Pakistanis in the U.S. – the largest concentration being in tri-State area of New York/ New Jersey/ Connecticut. There are large concentrations also in Chicago, Texas, Florida and also on the West Coast. They come from diverse backgrounds and are now among the most prosperous of the newer migrants to the U.S. At one end of the spectrum are cab drivers and at the other are multi-millionaires. It is a community with a very impressive record of achievements. They contribute both to the country of their adoption and to the country of their origin. Many are involved in promoting and funding projects in social sectors in Pakistan. I admire that spirit. Even the second generation Pakistanis here are enthusiastic about doing things in social sector development – they want to help less advantaged brothers and sisters back home. Their bond is still very strong with the country.